At a time when smaller publishers are struggling to survive, ProPublica is backing local journalism. The nonprofit announced this summer that it was expanding its Local Reporting Network program with a new grant to fund reporters looking into state governments. Fourteen local newsrooms have been selected. “The widespread decline in local journalism is particularly acute in state capitals and state bureaus,” Charles Ornstein, ProPublica senior editor, told Publishers Daily at the time. The nonprofit journalism organization first introduced the program last fall to provide monetary support to investigative reporters at local news organizations. Starting next year, seven of the 14 newsrooms will have journalists focused on covering state politics, which can mean state governments, education, prison and health care, and seven will cover a variety of other subjects. The number of journalists covering state capitals has “dropped considerably," Ornstein said. “The role of state governments is on the rise, and the decisions they make affect people across the state. But coverage is growing weaker." Pew Research Center estimated a 35% drop in journalists working in state capital bureaus from 2003 to 2014. The newsrooms selected for the 2019 ProPublica Local Reporting Network were chosen from more than 215 applications from 43 states, as well as Washington, D.C., and Puerto Rico. 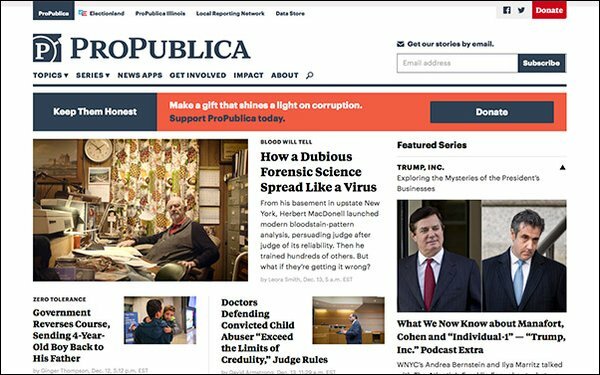 ProPublica will pay the salary for one full-time investigative reporter at each news organization. The program will last one year. Reporters continue to report to their home newsroom, but also collaborate with a ProPublica editor and get access to data, research and engagement. Their work will be published by both their home newsroom and ProPublica. Two reporters based in Illinois will complement the Chicago-headquartered newsroom ProPublica created last year to investigate wrongdoing across the state. One of those projects, a collaboration with the Chicago Tribune about the tax-assessment system, was a finalist for the 2018 Pulitzer Prize for local reporting. Another recent initiative funded by the ProPublica Local Reporting Network by the South Bend Tribune in Indiana uncovered misconduct by the Elkhart County Police Department. This week, the Elkhart police chief resigned. - The Charleston Gazette-Mail (Charleston, West Virginia) — Ken Ward Jr.